(CNN) -- A fireball the size of a small truck, which shot through the sky over Australia Thursday night, was space junk from Russia's Soyuz rocket, astronomers said. More accurately, it was "object 40077," the third stage of the Soyuz rocket which was launched from Kazakhstan on Tuesday. It was hurtling around the Earth at some 18,000 mph, or almost 29,000 kilometers per hour. "What you're seeing in that fireball is it slowing down really fast. It's belly-flopping on the world's atmosphere at 18,000 miles an hour. That really hurts," said Jonathan McDowell, astronomer at the Harvard-Smithsonian Center for Astrophysics. 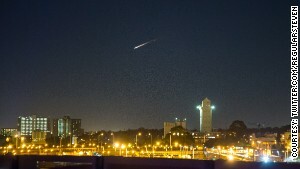 Residents who saw the fireball initially guessed it was a meteor. Some feared it was a plane crash and called emergency services. Photos started popping on Twitter with the hashtag #meteor. "Just saw the biggest meteor I've ever seen, going all way across the sky heading North, amazing!" Justin Nicholas tweeted. Steven Wright: "At first I thought it was a low-flying jet with some wild vapor trails, because it was moving that fast." Steve Wright was on the rooftop of a car park trying to take a photo of the Melbourne Star -- the city's giant Ferris wheel -- when he saw the fireball streaking through the sky. "I had no idea what it was, and at first I thought it was a low flying jet with some wild vapor trails, because it was moving that fast," he told CNN. "But because there was no sound, and it didn't make sense to see a vapor tail it behind the plane at night, I knew it had to be something else." While the fireball came as a surprise to residents, McDowell said astronomers had an early warning. Russia launched its Soyuz rocket on July 8 from the Baikonur Cosmodrome in Kazakhstan, carrying the Meteor-M2 weather satellite and other smaller satellites. The projected path of the third stage of the rocket showed it moving northbound between Melbourne and Canberra. "They're not usually seen because most of the Earth is either ocean -- or very sparsely inhabited. And of course, if it comes down in the daytime, you may not notice as easily," McDowell said. "You get reports like this a few times a year. Maybe once or twice a year, but it happens much more often." One user on Twitter couldn't let the relatively rare opportunity pass without using it as an excuse to join the latest meme involving Australian Prime Minister Tony Abbott. The Australian leader released an image earlier this week striking a pose with Japanese Prime Minister Shinzo Abe. Around 1,000 of these types of space junk have re-entered orbit since the start of the space age, McDowell said. "It's possible that some of the pieces might reach the ground but most of it would melt away."